Connected Vehicle technology is coming to the streets of New York City!. If you have any issue with accessing the links in the images below, please check them out here. Connected Vehicle technology is coming to the streets of New York City! This technology holds the potential to make our streets safer and smarter. The CV technology is a new tool to help NYC reach its Vision Zero goals to eliminate traffic related deaths and reduce crash related injuries and damage to both the vehicles and infrastructure. The NYC deployment is primarily focused on safety applications – which rely on vehicle-to-vehicle (V2V), vehicle-to-infrastructure (V2I) and infrastructure-to-pedestrian (IVP) communications. These applications provide drivers with alerts so that the driver can take action to avoid a crash or reduce the severity of injuries or damage to vehicles and infrastructure. The goal of this project is to show that the benefits justify the sustainability of the operation and will encourage others to outfit their vehicles thus increasing the benefits to all. Two major auto manufacturers are investing in DSRC and plan to roll out DSRC over the next few years. 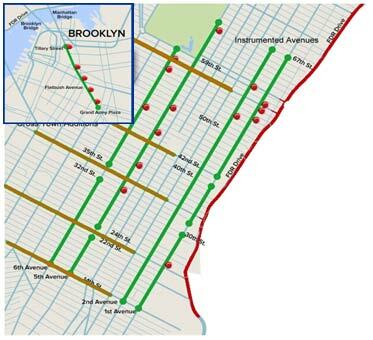 Approximately 300 road side units (RSU) will be installed in Manhattan, along Flatbush Avenue in Brooklyn, and at other strategic locations such as bus depots, fleet vehicle storage facilities, river crossings and airports. The NYCDOT leads the New York City Pilot, which aims to improve the safety of travelers and pedestrians in the city through the deployment of V2V and V2I connected vehicle technologies. This objective directly aligns with the city’s Vision Zero initiative.